This is an Entrance Only Ticket to Zrce Spring Break Europe 2019 in Novalja, Croatia from 30th May - 2nd June 2019. Ticket does not include any accommodation or boat party tickets. This ticket includes VIP entrance to Zrce Spring Break festival in Aquarius and Kalypso Clubs on Zrce Beach from 30th May - 02nd June. Exclusive VIP features : → Exclusive VIP area in Aquarius and Kalypso club (Headliner night). Guests will receive 3 jumbo cocktails each. → You'll be seated in prime view (headliners night) of the arena in Aquarius club and Kalypso club on Zrce beach, with dedicated staff and security. → Our acts and DJ’s could be frequenting the VIP area, both to socialise and relax themselves, so take the opportunity to get some photos taken with them or our models by our on-site photographers. → More exclusive add-ons for VIP you will get on Check-In! Please note that this is a VIP Ticket only and does not include accommodation or transport. This is an exclusive ticket to the official ZSBE2019 Boat Party. Upon your arrival to check-in (Main Bus terminal of Novalja (AdriaLink) travel agency) you will get your boat party wristbands and exact time of departure with all details. 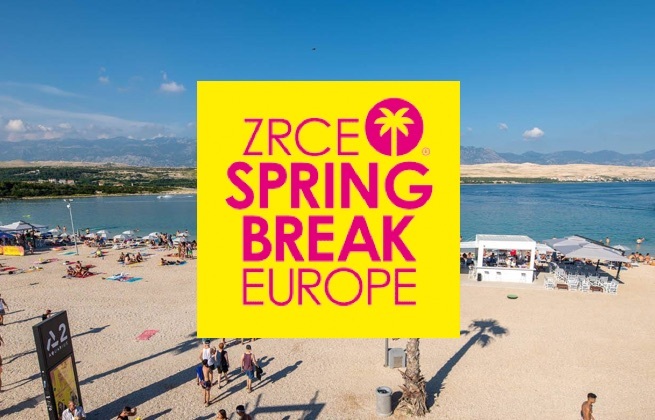 Official Zrce Spring Break Europe staff will be around ready to help at any time. This is a 3 night package to Zrce Spring Break Europe 2019 in Novalja, Croatia. All packages (except "Entrance Only" tickets) will get a verified apartment in Novalja on island Pag, only 2km away (5 minutes of driving) to Party zone, Zrce beach. You will also get bus wristbands for free transfers from Novalja to Zrce beach and back. All apartments consist of a fully equipped kitchen, bedroom(s) (all bed linen provided), bathroom (towels provided) and there is parking available. Please note that images illustrate standard apartments and do not represent your specific apartment. This is a 3 nights VIP package to Zrce Spring Break Europe 2019 in Novalja, Croatia. All our package (except "entrance only" tickets) will get verified apartment in Novalja on island Pag, only 2km away (5 minutes of driving) to Party zone, Zrce beach. You will also get bus wristbands for free transfers from Novalja to Zrce beach and back. All apartments consist of a fully equipped kitchen, bedroom (with sheets & quilt are provided), bathroom (towels are provided) and a parking place. Please note that images are for illustration of standards apartments only and do not represent your specific apartment. This is a 3 nights girls only package to Zrce Spring Break Europe 2019 in Novalja, Croatia. All our package (except "entrance only" tickets) will get verified apartment in Novalja on island Pag, only 2km away (5 minutes of driving) to Party zone, Zrce beach. You will also get bus wristbands for free transfers from Novalja to Zrce beach and back. All apartments consist of a fully equipped kitchen, bedroom (with sheets & quilt are provided), bathroom (towels are provided) and a parking place. Please note that images illustrate standard apartments only and do not represent your specific apartment.